This post was written and published on 07 Oct 2011. This is a REPOST. I was volunteering with SPCA on a World Animals Day last two weeks at the East Coast Beach. My concern used to be abused pets since I really love dogs and I’ve been living with dogs since I was one day old. I was a signaler for the agility championship and I had the time of my life watching these smart creatures, until on a break time, I walked along the booths of the animal fair and found out about a smarter creature, much MUCH smarter creature, Dolphins. 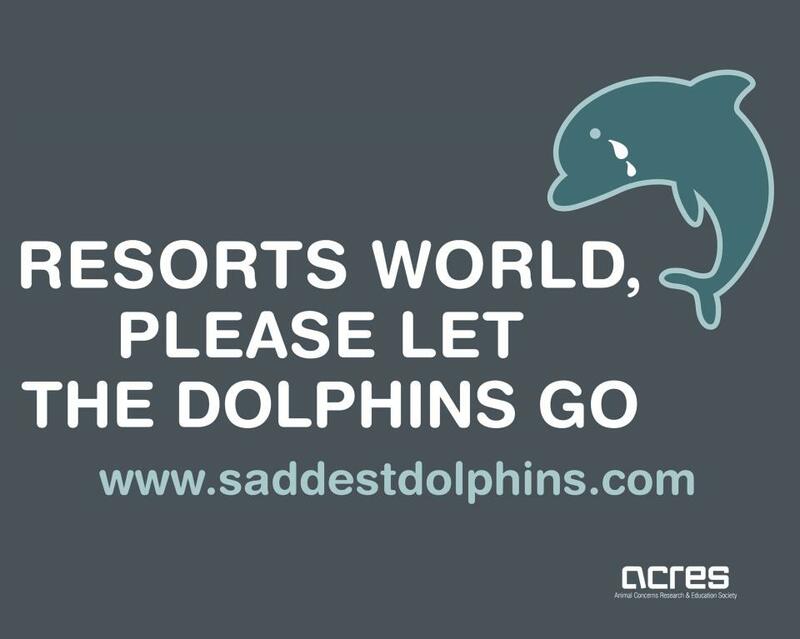 I was touched with this “Save the Saddest Dolphins” campaign, and straightaway signed the petition. A week later, Ric O’Barry came to Singapore, and I had a chance to attend a dialogue session with him. I was inspired by so many people who have done a lot for this cause and of course, him. He was a funny and optimistic guy and human race must be very proud to have him. And he received one hell of a great clap. No excuses are allowed to do any harm to the environment. I was never keep my eyes off from this issue ever since. Dolphin is a very VERY intelligent being, could have been even more intelligent than human being. Dolphin has emotion, like us. They can feel sad, depressed, happy and free. Dolphins have feelings. When they were captured in the ocean, separated from their families and friends they felt a traumatic fear. And then when they were forced to train for tricks just to get dead medicated fish, they turned to be depressed. Now they just swim round and round and round and round and go slowly mad. Dolphins can commit suicide. It’s because they’re that intelligent. Some of captivated dolphins still have hopes to get back to the ocean and some of them who just couldn’t take it anymore, committed suicide. Dolphins save human lives. But look what humans do to them. :( You are given a chance to save theirs back. Let’s do this! If you had time and energy, volunteering. You could volunteer to any NGO concerning about this issue, such as ACRES. If you had extra money, donating. If you had friends, tell them about the TRUE FACT. Spread the word. Silence is agony. If you have DVD player, watch The Cove. If you have twitter, tweet “#letthedolphinsgo” everyday until something happens. Never lose faith. 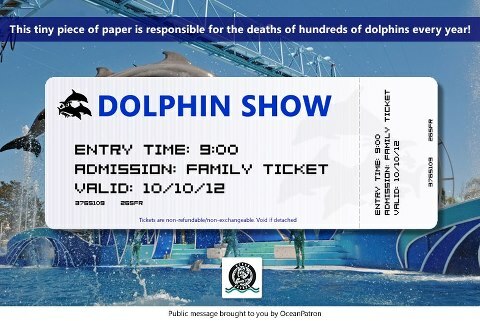 If you had self respect, please DON’T EVER EVER buy tickets to Dolphin shows, or tickets to aquarium that has dolphins. Resort World Sentosa still hasn’t released the dolphins. On November 22nd, Wen Wen, a dolphin that was shipped from Phillipines to Singapore and supposed to add more crowds in Sentosa died. ACRES held a memorial service at Clarke Quay and spread more awareness about this issue. As hurtful to see a died Dolphin, we hoped that RWS finally could open their eyes to the fact but they didn’t. Two days ago, I saw a bias news on local TV, advertising how putting dolphins in aquarium is good for kids’ education. I was SICK of them, those hypocrite people who puts their own needs and pretend like they are not aware of this issue. I don’t mean to be some animal activist freak who thinks they are better than other people and I am not a vegetarian myself so I don’t have the rights to talk like I’m doing some changes for the dolphins. What I know is I DO REALLY CARE about this issue and I found this to be very disturbing and ALL I CAN DO IS writing this, to raise awareness. NEVER GO TO THE DOLPHIN SHOWS. EVER! I believe people who reads my blog are smart and logical. Remember that Victor Hugo said “Conscience is the highest justice.” If your conscience thinks it’s right to satisfy your entertainment needs for going to the dolphin shows, go ahead. But again, educate yourself with facts, don’t hide under the bed and chose not knowing. You’re not knowing doesn’t mean the problem is not there. Just trust your conscience. I do. This entry was posted in Dreamer's highways and tagged #letthedolphinsgo, ACRES, animal abuse, animal cruelty, Dolphins, Dolphins Captivity, Ric O'Barry, The Cove. Bookmark the permalink. Well said, well written!! Gw juga pernah nonton di discovery channel yang hewan2 betapa kasiannya mereka itu (and all the animals yang suka dijadiin tontonan itu). My action is not as big as yours yet. But I never go to such shows anymore!! Nevaaaa’!!!! Kudos to you. It’s a cause which deserves everybody’s support. And not just dolphins. They are mammals we can identify with. But there are lot of other animals who fall victim to the most ferocious mammal on earth. Treatment of animals in labs, in factory farming, in circuses and you name it often is abominable. There’s a lot of human exploitation of fauna and flora which should be stopped. this is why my husband never let me see this kind of show. His reason is somewhat similar to this blogpost you have here. Previous to that I actually thought dolphin (and even whale) shows are kinda cute, I even thought that the animals looked happy. Such a misperception. eh kok di GR gua adanya posting tentang itinerary ke Singapore ya? tapi pas kemari kok gak ada? I guess I’ll leave my comment here too in case you miss my reply on my blog. Like I said, there are dolphin shows in Indonesia too, but Jakarta Animal Aid Network (JAAN) is working to put an end of this madness. Anyway, it’s always nice to “meet” other animal lovers. Let’s keep doing what we can to help them!! Paws up! Personal: We're gonna keep going.